01/22/2019 – COMSA Industrial has built two small bridges over the canal that crosses the town of El Rosario, belonging to the district of Végueta (Peru), with the aim of enhancing the movement of people and vehicles. This is a corporate social responsibility measure that the engineering company has carried selflessly out to meet the demands made by local representatives. To this end, COMSA Industrial has built a cement bridge to allow the passage of vehicles and, a few metres away, a wooden bridge for pedestrians. 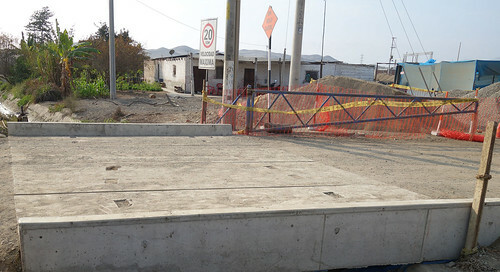 This infrastructure facilitates communication between the rural villages of the area and the city of Huaral, thereby reducing the daily travel times of the local population. The high voltage substation ‘Medio Mundo’, which is owned by ENEL Distribución and whose maintenance tasks are the responsibility of COMSA Industrial, is in the municipality of El Rosario. This facility enables the supply of energy to the Norte Chico region of Lima. Through this initiative, the company is reinforcing its commitment to the development of new infrastructures to improve the quality of life in the communities where it operates.